You may venture to this Andalucia hacienda and riding school to brush up on your dressage skills or try training and trail riding, a combination of lessons and time on the trails. Riders and non-riders may enjoy the variety of activities available from the central location, near the Seville Airport and downtown Seville, especially exploring the vibrant city of Seville with its impressive churches, tapas bars and magical winding streets. Andalucía, Spain is renowned for its warm sunny weather, friendly people, good food and natural beauty. In the heart of Andalucia, this longtime British Horse Society approved riding center is run by Fernando Garcia and his daughter Vivi, who studied under Olympic dressage medalist Rafael Soto at the Royal Andalusian School of Equestrian Art. The family has organized training and trail riding holidays since 1985. With more than 60 horses and ponies that are well mannered and schooled, they are equipped to accommodate a variety of vacations. The riding vacation itineraries are adapted as necessary to suit both experienced and less experienced riders, so that families or groups with different abilities may ride together. You’ll ride at a 16th century hacienda and enjoy local food, and culture. On the training and trail riding adventure, ride to a historic hacienda, take in the freedom of beach riding and nature at Donana National Park, and ride through olive groves. 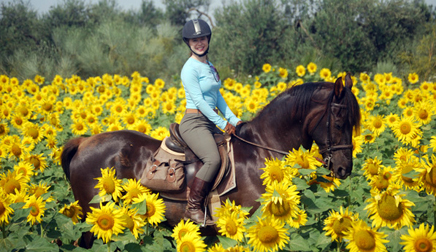 The terrain around Epona is wide open and flat with very few fences, blanketed with flowers in the springtime and with a variety of interesting crops all year, such as olive groves, and sunflowers. In the afternoons, you can brush up on your riding skills by taking lessons in dressage or more general riding skills. The equestrian facilities include a covered arena, which is particularly important in Spain where one may wish to escape the heat of the midday sun. There is also an Olympic-sized dressage arena, as well as two additional rings, a jumping arena, a cross country course, and beautiful countryside and trails. The Center also has permission to ride for up to three hours at any time over the dunes, through the surf, and along the magnificent beaches of Doñana National Park. For the Intensive Dressage Training, riders enjoy instruction in the mornings and afternoon and may want to add in a few trail rides, just for fun. Special Dressage trips include lessons with Olympic Silver Medalist Rafael Soto and special training in Classical Dressage and High School Training, all the while enjoying Spain. The programs are primarily designed for adults but families are welcomed. The children's program varies slightly from the adult program. Young children spend more time in classes and take shorter trail rides, according to their ability. They are also encouraged to take part in the practical care of their pony. Feautured in Equitrekking Southern Spain, part of Equitrekking’s fourth season on PBS. You may meet your hosts Vivi and Fernando Garcia in this episode. Featured in several magazine articles and TV programs. An approved British Horse Society Training and Examination Center. All ride leaders and assistantant ride leaders hold diplomas from British Equestrian Tourism and the Federation of International Equestrian Tourism (FITE). Take a look at Equitrekking Travel's General Packing List for suggestions. Time out of the saddle here is very casual. In spring, autumn and especially in the summer months, it can be hot, so natural, light fabrics, are recommended. Long sleeve shirts are best for protecting the shoulders against sunburn or low hanging branches on the trail rides. For winter, layers allow the rider to adjust appropriately to temperature changes. This training center is approved by the British Horse Society. There are 60 horses on site and the breeds used are mostly Andalusians and Andalusian crosses, but there are also a few Lusitanos and Warmbloods. On site at the hacienda, enjoy language and flamenco dance lessons for an additional cost. There are many other activities easily available in the area, such as five golf courses around Seville and sightseeing in the cities of Sevilla and Carmona. Travelers may rent a car or arrange for transfers from Epona for an additional cost. The cities of Cordoba (one hour away), Ronda and Granada (two hours away) are ideal for day trips. During Christmas, the hacienda is closed. SICAB International Spanish Horse Show- Every year, end of November in Seville. Includes a trade show with shopping, Spanish National Conformation Championship, the ANCCE Dressage Cup, the ANCCE Doma Vaquera Cup, and evening performances. Stallions, mares and young stock may be admired throughout all the events programmed during the week. Cabalgata de Reyes (The Three Kings Parade) has been held in Seville every year since 1918. Full of light and color, the Kings, their pages and ladies, all attired in Carnival costumes, throw armloads of sweets to the children. Holy Week, Semana Santa, in Seville- This week leading up to Easter features religious processionals throughout Seville of these enormous floats, called ‘paseos’ and is a popular time to visit Southern Spain. Seville’s April Fair ‘La Feria de Abril’- Festivals across the city of Seville, every year, about two weeks after Easter week. The fair officially begins on Monday at midnight. It ends with fireworks the following Sunday at midnight. Flamenco, bullfighting and horses are a theme for this week. At noon every day the 'Paseo de Caballos' features locals in their full flamenco dresses in a parade through the city. In the Plaza de Toros each night, there are bullfights. Jerez Horse Fair- Cultural celebration with local food, Andalusian horses, Flamenco and more. There are over 4000 horses living in complete freedom in the marshlands of Doñana Natural Park. Thousands of wild horses are moved as a large herd through the streets of the village, being guided and driven by the local cowboys attired with their traditional outfits. Guests stay in the Hotel Alcazar de la Reina, a beautiful four-star hotel in the in the heart of the old town of Carmona, surrounded by churches, convents and other palaces. Bright rooms are decorated in classic style with twin beds. All are equipped with full marble bathrooms, a minibar, satellite TV and safe. Guests are transported in the morning to the riding center, located at a 16th century hacienda, where the different itineraries will progress as normal. Guests have lunch at the hacienda and will be driven back to the hotel after the afternoon classes have ended. During the day, travelers are welcome to make full use of the hacienda's amenities, (swimming pool, wifi,etc. ), and will be provided with comfortable sitting and resting areas, as well as changing rooms with lockers where they can store their riding gear and personal belongings. Meals are included as indicated under each Itinerary. For dinners, only the first welcome dinner will be included. Monday to Thursday, guests can choose to eat at the hotel at one of the many tapas bars or restaurants in the immediate area, but these meals will not be included in the price. Friday night, as normal, the dinner in Sevilla is not included. The ideal guest would be one who is keen to improve their riding skills and learn about the Spanish culture. An interest in dressage is key for the dressage training programs. This is a six night, five day riding holiday designed for those who share a passion for horses and want to ride in Spain! The combination of "trail riding and equestrian training" is ideal for riders who believe that trail riding is one fo the best ways to have fun, make new friends, relax from the stress of modern-day lifestyles and see Spain from another angle, while devoting some time to improving your horse riding skills so that your confidence in, and enjoyment of, horses will increase greatly over the week. Sunday to Saturday year-round, except the two last weeks of July, the first two weeks of August and Christmas week, when the hacienda is closed. * Prices subject to change based on currency conversions and inclusions are listed in the below itinerary. The immediate countryside surrounding the Spanish hacienda and stables allows for miles of open, slightly rolling land in which frequent trots and canters will be possible. Fast gallops are not possible, as we do not have turf. You will be riding through fields of wheat, sunflowers and olive groves, and orchards of orange and peach trees. One of the rides will be in the Doñana Natural Park, one of the largest natural reservations in Europe. Here the terrain is very different to the land around the hacienda as you'll be riding through sandy dunes where the air will be scented by lavender, thyme, rosemary and the nearby ocean. You will be walking through the dunes and then you'll reach the virgin beach of "El Asperillo": the best spot for a trot and a long canter. However if you don't know how to trot or canter or you don't wish to do so you will be taken on a separate ride where you'll go at the pace in which you're comfortable. All the ride leaders are fully qualified and speak fluent Spanish and English. Normally the owner, Fernando will be your guide and will tell you about the Haciendas you pass on the rides, the agriculture and the history of the area. From it's origins in Ancient Greece with Xenophon, until the present times embodied in the four European Schools of Equestrian Art, Classical Dressage has evolved into different styles, but always maintaining the same goals: To achieve beauty and perfection in the performance of dressage and High School movements only possible through harmony, balance and complete communication with the horse. Classical Dressage went beyond admiring the rider for his courage and skill as a soldier but gradually started to appreciate other talents such as feeling and sensitivity elevating horsemanship to a new level: horses began to "dance" and Dressage gained the status of a new form of Art. Comparable to Ballet, it requires the technique and strenght of the athlete, but also the sense of feeling and aesthetics which, when performed correctly will succeed in moving the spectator. At this Spanish riding school, there are horses and Instructors prepared to cater for guests of all levels, from complete beginners to advanced riders. Groups are divided so as to keep the levels similar and these usually are of 2 to 4 riders. We can also arrange the driver to pick-up as normal. Transfer to the hotel in the nearby town of Carmona, one of the famous white villages of Andalucia. Carmona is the oldest continually inhabited village in Europe and as you stroll through the narrow streets of the old town, you will feel and breathe the spirits of ancient cultures, Iberians, Visigoths, Phoenicians, Romans, Moors, in the innumerable examples of their architectural influence in the churches, towers, palaces and mansions as well as in the inherited customs. 8.45 p.m.: Welcome tapas dinner in the hotel, hosted by a member of the staff. (Normally Fernando) Savour the delights of the local cuisine which still makes full use of ingredients which compose the famous healthy Mediterranean diet, olive oil, garlic, onions, vegetables and fruit. 9.00 a.m. Transfer from hotel to the riding center and stables, located in a historic hacienda. 9.15 a.m. Tour of the stables and amenities, including the swimming pool, wifi, etc. Guests are welcome to join yardwork and grooming if they wish, or mount up for a trail ride, perhaps to the Old Hacienda, a relaxed hack around the immediate coutryside, through olive groves and eucalyptus trees. Another ride might be to the old Roman bridge. Depending on the time of the year you could be riding through fields of sunflowers, wheat, cotton, oranges or peaches, through olive groves with ancient trees still carefully tended and nurtured. It is a countryside where there are very few fences. Depending on the season, you could see fields of sunflowers, wheat and cotton, as well as melons and water melons in late summer. The ride takes you past impressive 16th and 17th century Haciendas and Cortijos, which have stood here since the days when Cervantes rode these same trails, collecting olive oil taxes. Return to the hacienda for lunch with typical Andalusian home cooking, courtesy of our resident cook and sample our excellent local house wine. 9.00 a.m. Pick-up at hotel for trip to Jerez. Jerez de la Frontera, in the province of Cádiz is about one hour and a hlaf away by car. Jerez is intemationally renowned for its production of sherry and brandies. However, the main attraction of the day will be the visit to the Real Escuela Andaluza del Arte Ecuestre, an equestrian performance titled, "How the Andalusian Horses Dance" (Ticket Price: 27 €). Here you will be priviledged to see the magnificent Andalusian stallions at their best, at home in the breathtaking setting of their 18th Century palace and the riding hall. They will be performing piaffe, passage and the airs above the ground (courbette, capriole, etc) in a spectacle of light, music and colour, only to be compared with the famous Spanish Riding School of Vienna. Fernando is well known at the school and is good friend with many of the world famous riders. Vivi trained at this school for four years and frequently performed in the show. Otherwise, same schedule as Monday. If you do the beach ride, you'll set off early to the seaside village of Matalascañas, where sturdy Spanish horses, most in Spanish tack, will be waiting to take you on the Beach Ride. The ride takes you on an unforgettable route through the Donaña Natural Park bordering the National Park of the same name, one of Europe’s last true wilderness regions and one of the largest wildlife reservations in Spain. The ride will take you over the golden dunes, brushing through fragrant wild lavender, rosemary and thyme. The area is home to many protected species such as fallow deer, boar, fox, lynx, imperial eagles, kites, vultures, storks, flamingos and herons. Down to the beach and it’s time for the horses to wet their legs and for those who want to, a canter through the surf. ** Please note that this itinerary is flexible and subject to changes and revisions based on the weather and other unforeseen circumstances. This is a riding holiday designed for those who prefer to concentrate on improving their riding skills, and enjoy the well trained, sensitive Andalusian horses and top class instructors. This riding holiday is very popular with guests who visit for the second time (and those who just keep coming back!). The riding vacation includes lessons in the morning and afternoon, plus some lunging sessions which are excellent for improving seat, balance and posture. Sometimes a guest may wish to change one of the lessons for a trail ride, just for fun. Guests are welcome to join yard work and grooming. Be ready to mount up at 10:30 approx, after the trail riders leave for their morning ride. Everything is quieter now, ready for the dressage lessons. Your first lesson will be an assessment for your instructor, who will note your good points and the areas which need to be worked on. It is also the first chance for you to get used to your horse and the more sensitive style of riding required for the Andalusian and Iberian horses. Our goal is that you get as much improvement and fun out of your lesson as possible. Meet the rest of the group for lunch in our own cafeteria where you will have your first experience of typical Andalusian home cooking, courtesy of our resident cook and sample our excellent local house wine. Spend part of the afternoon can be spent by the pool, or if you are feeling in need of culture, take a bus into Carmona to explore the old streets, the archaelogical sites or the Roman Necropolis, the second largest in the World after Rome itself. Equitation lessons will take place in the late afternoon when life is a little cooler. Early breakfast at 8.30 a.m., before leaving at 9.00 a.m. for Jerez de la Frontera, in the province of Cádiz, one hour and a half away by car. Jerez is intemationally renowned for its production of sherry and brandies. However, the main attraction of the day will be the visit to the Real Escuela Andaluza del Arte Ecuestre, an equestrian performance titled, "How the Andalusian Horses Dance" (Ticket Price: 27 €). Here you will be priviledged to see the magnificent Andalusian stallions at their best, at home in the breathtaking setting of their 18th Century palace and the riding hall. They will be performing piaffe, passage and the airs above the ground (courbette, capriole, etc) in a spectacle of light, music and colour, only to be compared with the famous Spanish Riding School of Vienna. Fernando is well known at the school and is good friend with many of the world famous riders. Vivi trained at this school for four years and frequently performed in the show. 9.00 a.m. Get picked up for the riding center. Same schedule today as Wednesday, except that today we will include your second lunge session. In the morning, enjoy your last lesson. By this time you might be performing some of the more advanced moves (this will depend on the riders ability). This riding holiday designed for riders with a good level of ability. It's for those who have a great passion for Dressage and are ready to work hard for a week to really get a "push on" with their riding. As well as this, it is aimed for people who are not only interested in the Classical Dressage ways of riding, but also in the procedures used for training these magnificent horses. This is a unique opportunity, not easily found at other riding vacation destinations. Guests will be immersed in the day to day riding and training that goes on at a Spanish riding center. It's a great chance to get a real good feeling of the sensitive Andalusians and Iberian horses, trained to High School level, and to enjoy some of the advanced movements, such as Passage, Piaffe and Spanish Walk, which even very good riders don't often get a chance to experience. This programme includes many private lessons, one of which will be with Olympic medallist Rafael Soto, semi private lessons, ground work sessions (working on training piaffe, passage and Spanish walk) and lunge sessions, working on improving the classical seat. Most of the lessons will take place in the morning leaving most aftemoons free for guests to enjoy some shopping or sight seeing in the nearby towns, if they wish, or, altematively, to stay at our facilities just relaxing or watching the afternoon lessons and other riding that might be taking place. (In fact, some guest often opt to join these lessons as an extra if places are available). The programme also offers the option of visiting the training session at the Royal Adalusian School of Equestrian Art (Extra cost), and your guide will be happy to comment about the training methods, horses and riders, most of which are of international fame, as well as great friends of the García family. Usually guests prefer to visit the weekly Show, "Those Amazing Dancing Andalusuian Stallions" which should not be missed, but for those who have already seen it before, the Training Sessions is a very interesting option (More on Training). Guests are welcome to join yard work and grooming if they wish. Be ready to mount up at 10:30 approx, after the trail riders leave for their morning ride. Everything is quieter now, ready for the dressage lessons. Your first lesson will be an assessment for your instructor, who will note your good points and the areas which need to be worked on. It is also the first chance for you to get used to your horse and the more sensitive style of riding required for the Andalusian and Iberian horse. Our goal is that you get as much improvement and fun out of your lesson as possible. After this first session, take a short break, a drink, then change to your new mount for your private lesson. After you have recovered a little it is time for your first lunge session, great for improving your seat, balance and posture. Once the lessons are over, relax with a book in the garden or by the pool. You are also more than welcome to stay and sit by the arenas and watch the daily training of our horses. Vivi, our main horse trainer will be more than happy to answer any questions about our trainig methods and our horses. Meet the rest of the group for lunch in our own cafeteria where you will have your ﬁrst experience of typical Andalusian home cooking, courtesy of our resident cook and sample our excellent local house wine. The aftemoon is free and it can be spent by the pool, or if you are feeling in need of culture, take a bus into Carmona to explore the old streets, the archaelogical sites or the Roman Necropolis, the second largest in the world after Rome itself. Another option is to just sit and watch the afternoon lessons or other riding that may be taking part. Some guests are often keen to join these lessons if there are places available. The lessons will take place as soon as the trail ride leaves. As the week progresses so will your dressage, hopefully performing more advanced movements, like: piaffe-passage and spanish walk. Once your lessons are over (or between them) feel free to sit by the arena and continue observing the daily training of the geldings, mares and stallions, from young and green to very advanced. We also train and exercises the schoolmasters periodically to keep them sensitive and in good shape for guests to enjoy and get the most beneﬁt out of. This is a seven nights, six day's riding vacation where you get to train with Olympian Rafael Soto! * Prices subject to change based on currency conversions. This is a seven night and six day riding program of intensive dressage with Spanish Olympic Team Silver Medalist Rafael Soto. Spanish Olympic Team Silver Medalist Rafael Soto is world renowned and respected by dressage enthusiasts and fellow riders alike. What most people don't know is that in his early years, Soto was rejected by other riders as 'impossible to train', due to his immense size, strength and laid-back disposition. In this Intensive Dressage Clinic, you have a rare opportunity to learn from a champion. Commencing Sunday after 4.00 p.m., ending Sunday before 11.00 a.m. These lessons will determine the level and most suitable mount for maximum benefit during the 4 x 45 minute private sessions with Rafael Soto. Participants will also have a chance to sit in and observe the lessons of the other guests. Last night cocktail/conference with Rafael and staff, where progress will be discussed and all participants will be presented with a Diploma. Ms. Compton had a daily lesson, a lovely room in the hacienda and meals on a patio. What she didn't expect was the cultural richness. On morning trail rides, she and her friends came across olive groves, a Roman bridge and farmers tending their land. In other words, "the history of the place," said Ms. Compton, 54, who is the executive director of a nonprofit organization. "It gave us real insight into old Spain." During a second trip to Spain with my husband, we discovered a wonderful riding center near Seville. It is a family owned and operated equestrian center with dressage as one of its specialties. We both fell in love with the setting, the horses, the Garcia family and the great staff. After a number of visits "across the pond," we also feel like family. My week was magical. I had wanted to do it for awhile, and finally the stars aligned. I had pretty high expectations, so was ready for some disappointment - I couldn't imagine it could really be all I hoped it might be. Wrong! It exceeded ALL my expectations. First, the riding. I got to do things on a horse that I never dreamed I'd ever get to do. Every horse was so well-trained that advanced movements were easy - from shoulder-in to half-pass to pirouette. Lessons were great - from Vivi as well as Raphael. I think my riding improved more in that week than any other week in my life. And the best part ---- I was able to put into practice what I learned when I got home. I finally knew what a "correct" half pass felt like - not to mention piaffe and passage. (We of course had less success replicating piaffe and passage, but we DID get a half pass.) Everything other than the riding was just as fabulous. The Hacienda is gorgeous and comfortable. The food is to die for. And the Garcia family --- I felt like I was vacationing with friends. I made good friends with the other students and am trying to plan my next visit. I just returned from having spent a week there for the intense training program, which includes a two day clinic with Olympian Rafael Soto. A friend asked what was my favorite part? Hard to pick...but if I had to pick, it would be the Garcia family. Every member of the family had an important job to perform to make it such a special place. How often do you see that?.....Jane's wonder gourmet cooking and the pride in her presentation of the food...Fernando's humor, his stories, and his hospitality - always gets the best seats in the house wherever you go....sisters Vivi and Caty are very talented riders/trainers, superb teachers, humble and kind. Then there was the working student from Australia, also named Jane, who was fun, sweet and very helpful, great accent! I loved the hacienda, the weather, the mornings, the evenings, the horses(wonderful!) and the lessons. And, of course, Spain...Carmona...Seville...The Royal School. It was all special and unforgettable. I hope to return. This is the late John A. Crow's classic study of the cultural history of Spain and its people, which he last updated in 1985 but which seems as fresh and pertinent as when he first wrote it. Crow devoted a lifetime to Hispanic studies and here provides a historical interpretation of Spanish civilization from its earliest beginnings to the present. The scope of this study is remarkable and includes chapters on Roman Spain, the Jews in Spain, the Moors, life in medieval towns, and the Golden Age of Spain, plus a view of Franco's legacy. A lavish history of classical riding, from ancient times to modern competition, now available again. Featuring more than 100 photos. Classical riding historian Sylvia Loch here traces the development of classical equitation ‹ from antiquity, through the Baroque period of splendid enlightenment, to Nuno Oliveira, the Spanish Riding School, and modern dressage competition. Remarkably, this is the only English-language book to comprehensively cover all the great masters, past and present, and to explain in depth the methods and schools that they represent. This spellbinding literary travel guide gathers poetry, nonfiction, and fiction about Spain by forty English and American writers. Here are letters and memoirs from Lord Byron, Edith Wharton, and Henry James; a poem about Picasso by E. E. Cummings; and a comic tale by Anthony Trollope in which two Englishmen mistake a Spanish duke for a bullfighter. W. H. Auden, George Orwell, and Langston Hughes record their experiences in the Spanish Civil War, Ernest Hemingway takes on bullfighting, Richard Wright is beguiled by gypsy flamenco dancers, and Calvin Trillin pursues an obsession with Spanish peppers. From Chris Stewart’s memoir of his rural retreat in Driving Over Lemons to Barbara Kingsolver’s idyllic portrait of the Canary Islands in “Where the Map Stopped,” the glimpses of another world in Spain in Mind will enchant you. 1 – 8 riders. Exceptions can be made for block bookings. No minimum number or riders. See "Itineraries" tab above for more information on these Spain riding vacation packages. Most of the tack is with English tack, however a McClellan saddle, a Western saddle, an Australian saddle, and a Spanish country saddle are available on request. Walk to canter; however if you don't know how to trot or canter or you do not wish to do so, you will be taken on a separate ride where you'll go at the pace in which you're comfortable. Mostly Andalusian and Andalusian crosses, but also a few Lusitanos and Warmbloods. Families with children eight years and older are welcome and ponies are available. The beach trail is not suitable for children under the age of twelve and a child’s participation in this ride is decided after their ability has been assessed at the Center. There are no specific entertainment facilities for children and babysitting services cannot be guaranteed while parents are riding, although all efforts are made. Children or teenagers under the age of eighteen are not permitted unaccompanied. Regardless of the program you choose, there are approximately four hours of riding per day. At the basic level, lessons will focus on the rider’s balance, seat, position and control, while gaining confidence. When working with more experienced riders, instructors will be giving guidance towards riding your horse in a correct outline, straightness, balance, and rhythm. As the week progresses, lateral movements such as shoulder in, travers, renvers, half pass, and depending on the riders level and ability, flying changes, and pirouettes can be explored. Sevilla International Airport is nearby. Transfers from airport are available. Complimentary transfers are offered between 3.00 p.m. and 8.00 p.m. After 8.00 p.m. there is a cost for transfers. Travelers are not required to rent a car unless a non-rider who wishes to do some sightseeing accompanies them. English, Spanish, French, Italian, and Swedish. March to June and September to November, though winters are very mild and the climate is excellent for riding. The Center is closed two last weeks of July the two first weeks of August, and the week of Christmas. The training and dressage with Rafael Soto is only available during special weeks.